Ankylosing spondylitis (AS) is mostly characterized by inflammation of the sacroiliac joints, enthesis and the spine. This study aims to determine gene expression profile of proinflammatory cytokines and their correlations with disease activity, spinal mobility, functional status, quality of life, and smoking in Iranian patients with ankylosing spondylitis. Peripheral blood mononuclear cells (PBMCs) were isolated from 48 patients with AS and 47 age and gender-matched healthy controls; then total RNA content of leukocytes was extracted, followed by cDNA synthesis from the mRNA of PBMCs. Quantitative polymerase chain reaction was performed to measure mRNA expression of TNF-α, IL-1β and IFN-γ genes. Clinical characteristics were evaluated and their correlations were analyzed with gene expression levels of the prionflammatory cytokines. A significant overexpression of TNF-α was observed in the patient group, but there was no significant difference in expression of other cytokines between groups. A positive correlation (P< 0.01) between TNF-α and Bath Ankylosing Spondylitis Disease Activity Index (BASDAI) and negative correlation (P< 0.05) between IFN-γ and Bath Ankylosing Spondylitis Functional Index (BASFI) were found. Eta-Squared test supported significant results about the smoking effect on Bath Ankylosing Spondylitis Metrology Index (BASMI) (P< 0.05) and IFN-γ (P< 0.01). Our results demonstrated that TNF-α was the most important cytokine responsible for inflammatory-related outcomes of AS in the Iranian population. Stolwijk C, van Onna M, Boonen A, van Tubergen A. Global Prevalence of Spondyloarthritis: A Systematic Review and Meta-Regression Analysis. Arthritis Care Res (Hoboken). 2015 doi: 10.1002/acr.22831. Tam LS, Gu J, Yu D. Pathogenesis of ankylosing spondylitis. Nat Rev Rheumatol. 2010; 6(7): 399-405. doi: 10.1038/nrrheum.2010.79. Zambrano-Zaragoza JF, Agraz-Cibrian JM, Gonzalez-Reyes C, Duran-Avelar Mde J, Vibanco-Perez N. Ankylosing spondylitis: from cells to genes. Int J Inflam. 2013; 501653. doi: 10.1155/2013/ 501653. Brewerton DA, Hart FD, Nicholls A, Caffrey M, James DC, Sturrock RD. Ankylosing spondylitis and HL-A 27. Lancet. 1973; 1(7809): 904-7. Tsui FW, Tsui HW, Akram A, Haroon N, Inman RD. The genetic basis of ankylosingspondylitis: new insights into disease pathogenesis. Appl Clin Genet. 2014; 7: 105-15. doi: 10.2147/TACG.S37325. Reveille JD, Sims AM, Danoy P, Evans DM, Leo P, Pointon JJ, et al. Genome-wide association study of ankylosing spondylitis identifies non-MHC susceptibility loci. Nat Genet. 2010; 42(2): 123-7. doi: 10.1038/ng.513. Hreggvidsdottir HS, Noordenbos T, Baeten DL. Inflammatory pathways in spondyloarthritis. Mol Immunol. 2014; 57(1): 28-37. doi: 10.1016/j.molimm.2013. 07.016. Keller C, Webb A, Davis J. Cytokines in the seronegative spondyloarthropathies and their modification by TNF blockade: a brief report and literature review. Ann Rheum Dis. 2003; 62(12): 1128-32. Colbert RA, Tran TM, Layh-Schmitt G. HLA-B27 misfolding and ankylosing spondylitis. MolImmunol. 2014; 57(1): 44-51. doi: 10.1016/j.molimm.2013.07. 013. Cui X, Hawari F, Alsaaty S, Lawrence M, Combs CA, Geng W, et al. Identification of ARTS-1 as a novel TNFR1-binding protein that promotes TNFR1 ectodomain shedding. J Clin Invest. 2002; 110(4): 515-26. doi: 10.1172/JCI13847. Chen G, Goeddel DV. TNF-R1 signaling: a beautiful pathway. Science. 2002; 296(5573): 1634-5. doi: 10.1126/science.1071924. Chen X, Wu X, Zhou Q, Howard OM, Netea MG, Oppenheim JJ. TNFR2 is critical for the stabilization of the CD4+Foxp3+regulatory T. cell phenotype in the inflammatory environment. J Immunol. 2013; 190(3): 1076–84. doi: 10.4049/ jimmunol.1202659. Mansour M, Cheema GS, Naguwa SM, Greenspan A, Borchers AT, Keen CL, et al. Asadbeik et al.Ankylosing spondylitis: a contemporary perspective on diagnosis and treatment. Semin Arthritis Rheum. 2007; 36(4): 210-23. doi: 10.1016/j.semarthrit. 2006.08.003. Nicknam MH, Mahmoudi M, Amirzargar AA, Jamshidi AR, Rezaei N, Nikbin B. HLA-B27 subtypes and tumor necrosis factor alpha promoter region polymorphism in Iranian patients with ankylosing spondylitis. Eur Cytokine Netw. 2009; 20(1):17-20. doi: 10.1684/ecn.2009.0143. Ji Y, Yang X, Yang L, Wu D, Hua F, Lu T, et al. Studies on correlation between single-nucleotide polymorphisms of tumor necrosis factor gene and different stages of ankylosing spondylitis. Cell Biochem Biophys. 2013; 67(3): 915–22. doi: 10.1007/s12013-013-9582-z. Li B, Wang P, Li H. The association between TNF-alpha promoter polymorphisms and ankylosing spondylitis: a meta-analysis. Clin Rheumatol. 2010; 29(9): 983-90. doi: 10.1007/s10067-010-1499-y. Chung WT, Choe JY, Jang WC, Park SM, Ahn YC, Yoon IK, et al. Polymorphisms of tumor necrosis factor-alpha promoter region for susceptibility to HLA-B27-positive ankylosing spondylitis in Korean population. Rheumatol Int. 2011; 31(9): 1167-75. doi: 10.1007/s00296-010-1434-1. Vazquez-Del Mercado M, Garcia-Gonzalez A, Munoz-Valle JF, Garcia-Iglesias T, Martinez-Bonilla G, Bernard-Medina G, et al. Interleukin 1beta (IL-1beta), IL-10, tumor necrosis factor-alpha, and cellular proliferation index in peripheral blood mononuclear cells in patients with ankylosing spondylitis. J Rheumatol. 2002; 29(3): 522-6. Palomo J, Dietrich D, Martin P, Palmer G, Gabay C. The interleukin (IL)-1 cytokine family–Balance between agonists and antagonists in inflammatory diseases. Cytokine. 2015; 76(1): 25-37. doi: 10.1016/j.cyto.2015. 06.017.20. Mahmoudi M, Amirzargar AA, Jamshidi AR, Farhadi E, Noori S, Avraee M, et al. Association ofIL1R polymorphism with HLA-B27 positive in Iranian patients with ankylosing spondylitis. Eur Cytokine Netw. 2011; 22(4): 175-80. doi: 10.1684/ecn.2011.0293. Palucka AK, Blanck JP, Bennett L, Pascual V, Banchereau J. Crossregulation of TNF and IFN-alpha in autoimmune diseases. Proc Natl Acad Sci U S A. 2005; 102(9): 3372-7. doi: 10.1073/ pnas.0408506102. Feng Y, Ding J, Fan CM, Zhu P. Interferon-gamma contributes to HLAB27-associated unfolded protein response in spondyloarthropathies. J Rheumatol. 2012; 39(3): 574-82. doi: 10.3899/jrheum.101257. Moll JM,Wright V. New York clinical criteria for ankylosing spondylitis. A statistical evaluation. Ann Rheum Dis. 1973; 32(4): 354-63. Garrett S, Jenkinson T, Kennedy LG, Whitelock H, Gaisford P, Calin A. A new approach to defining disease status in ankylosing spondylitis: the Bath Ankylosing Spondylitis Disease Activity Index. J Rheumatol. 1994; 21(12): 2286-91. Jenkinson TR, Mallorie PA, Whitelock HC, Kennedy LG, Garrett SL, Calin A. Defining spinal mobility in ankylosing spondylitis (AS). The Bath AS Metrology Index. J Rheumatol. 1994; 21(9): 1694-8. Calin A, Garrett S, Whitelock H, Kennedy LG, O’Hea J, Mallorie P, et al. A new approach to defining functional ability in ankylosing spondylitis: the development of the Bath Ankylosing Spondylitis Functional Index. J Rheumatol. 1994; 21(12): 2281-5. Fuss IJ, Kanof ME, Smith PD, Zola H. Isolation of whole mononuclear cells from peripheral blood and cord blood. Curr Protoc Immunol. 2009; Chapter 7: Unit7 1. doi: 10.1002/ 0471142735.im0701s85. Schmittgen TD, Livak KJ. Analyzing real-time PCR data by the comparative C(T) method. Nat Protoc. 2008; 3(6): 1101-8. Strober W, Zhang F, Kitani A, Fuss I, Fichtner-Feigl S. Proinflammatory cytokines underlying the inflammation ofCrohn’s disease. Curr Opin Gastroenterol. 2010; 26(4): 310-7. doi: 10.1097/MOG. 0b013e328339d099. Strober W, Fuss IJ. Proinflammatory cytokines in the pathogenesis of inflammatory bowel diseases. Gastroenterology. 2011; 140(6): 1756-67. doi: 10.1053/j.gastro. 2011.02.016. 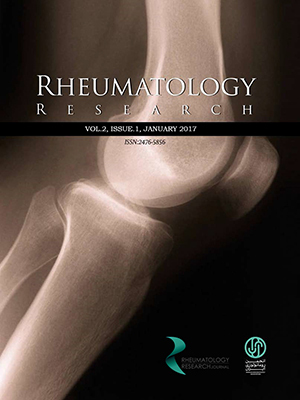 Smolen JS, Redlich K, Zwerina J, Aletaha D, Steiner G, Schett G. Proinflammatory cytokines in rheumatoid arthritis: pathogenetic and therapeutic aspects. Clin Rev Allergy Immunol. 2005; 28(3): 239-48. doi: 10.1385/CRIAI:28:3: 239. Martins TB, Rose JW, Jaskowski TD, Wilson AR, Husebye D, Seraj HS, et al. Analysis of proinflammatory and anti-inflammatory cytokine serum concentrations in patients with multiple sclerosis by using a multiplexed immunoassay. Am J Clin Pathol. 2011; 136(5): 696-704. doi: 10.1309/ AJCP7UBK8IBVMVNR. Dinarello CA. Inflammatory cytokines: interleukin-1 and tumor necrosis factor as effector molecules in autoimmune diseases. Curr Opin Immunol. 1991; 3(6): 941-8. Schett G. Pathophysiology of subchondral bone erosions in rheumatoid arthritis. Arthritis Res Ther. 2012; 14(Suppl 2): A14. doi: 10.1186/ar3721. Ostergaard M, Lambert RG. Imaging in ankylosing spondylitis. Ther Adv Musculoskelet Dis. 2012; 4(4): 301-11. doi: 10.1177/ 1759720X11436240. Pollard KM, Cauvi DM, Toomey CB, Morris KV, Kono DH. Interferongamma and systemic autoimmunity. Discov Med. 2013; 16(87): 123-31. Gratacos J, Collado A, Filella X, Sanmarti R, Canete J, Llena J, et al. Serum cytokines (IL-6, TNF-alpha, IL-1 beta and IFN-gamma) in ankylosing spondylitis: a close correlation between serum IL-6 and disease activity and severity. Br J Rheumatol. 1994; 33(10): 927-31. Braun J, Bollow M, Neure L, Seipelt E, Seyrekbasan F, HerbstH, et al.Use of immunohistologic and in situ hybridization techniques in the examination of sacroiliac joint biopsy specimens from patients with ankylosing spondylitis. Arthritis Rheum. 1995; 38(4): 499-505. Chou CT, Huo AP, Chang HN, Tsai CY, Chen WS, Wang HP. Cytokine production from peripheral blood mononuclear cells in patients with ankylosing spondylitis and their first-degree relatives. Arch Med Res. 2007; 38(2): 190-5. doi: 10.1016/j. arcmed.2006.09.008. Szekanecz Z, Koch AE. Macrophages and their products in rheumatoid arthritis. Curr Opin Rheumatol. 2007; 19(3): 289-95. doi: 10.1097/BOR.0b013e32805e 87ae. Rudwaleit M, Siegert S, Yin Z, Eick J, Thiel A, Radbruch A, et al.LowT cell production of TNFalpha and IFN gammain ankylosing spondylitis: its relation to HLA-B27andinfluence of the TNF-308 gene polymorphism. Ann Rheum Dis. 2001; 60(1): 36-42. Toussirot E, Lafforgue P, Boucraut J, Despieds P, Schiano A, Bernard D, et al. Serum levels of interleukin 1-beta, tumor necrosis factoralpha, soluble interleukin 2 receptor and soluble CD8 in seronegative spondylarthropathies. Rheumatol Int. 1994; 13(5): 175-80. Fallahi S. The Correlation between Pack-Years of Smoking and Disease Activity, Quality of Life, Spinal Mobility, and Sacroiliitis Grading in Patients with Ankylosing Spondylitis. Turk J Rheumatol. 2013; 28(3): 181-8. doi: 10.5606/tjr.2013. 3269. Zhang S, Li Y, Xu X, Feng X, Yang D, Lin G. Effect of cigarette smoking and alcohol consumption on disease activity and physical functioning in ankylosing spondylitis: a cross-sectional study. Int J Clin Exp Med. 2015;8(8): 13919-27. Sakellariou GT, Anastasilakis AD, Kenanidis E, Potoupnis M, Tsiridis E, Savvidis M, et al. The effect of smoking on clinical and radiographic variables, and acute phase reactants in patients with ankylosing spondylitis. Rheumatol Int. 2015; 35(12): 2109-14. doi: 10.1007/s00296-015-3381-3. Ward MM, Weisman MH, Davis JCJ, Reveille JD. Risk factors for functional limitations in patients with long-standing ankylosing spondylitis. Arthritis Rheum. 2005; 53(5): 710-7. doi: 10.1002/ art.21444. Mattey DL, Dawson SR, Healey EL, Packham JC. Relationship between smoking and patient-reported measures of disease outcome in ankylosing spondylitis. J Rheumatol. 2011; 38(12): 2608-15. doi: 10.3899/ jrheum.110641.